On the death of Lady Margaret in 1596, the manors of Marple and Wybersley came into the possession of her eldest son, Sir Edward Stanley of Tonge. Sir Edward, the last of the feudal lords, having no male heirs sold off the manors in question in 1606. Henry Bradshawe, younger son of William Bradshawe of Derbyshire, brought the estates of Marple Hall and Wybersley together with the "Place" in Marple, where he had previously lived as a tenant. This period marks the breakdown of the manorial system in Marple, as after these purchases the manorial rights were not exercised and fell into disuse. On his death in 1619 Henry Bradshawe I, the buyer of Marple Hall, was succeeded by his son Henry Bradshawe II. Henry II married Catherine, the daughter of Ralph Winnington of Offerton in 1594. Their first son died in his first year in 1597, the eldest surviving son Henry III was baptised in 1600 and he was followed by John in 1602 and Francis in 1604. Little is known of Francis, but John Bradshawe went on to become Marple's most famous son. Henry Bradshawe III inherited the estates on his father's death in 1654. Although he only held them for seven years it was Henry III who, in 1658, pulled down most of the original farmhouse and rebuilt the Hall which was to survive substantially unchanged for 300 years. He died in 1662 and was succeeded by his son Henry Bradshawe IV. 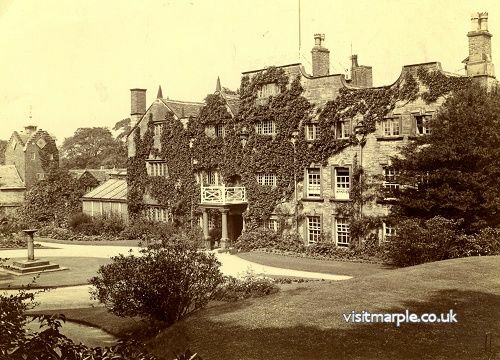 A fantastic view of Marple Hall from the west in 1919. Henry IV made considerable additions to Marple Hall by erecting the stables and outbuildings. They bore on their front to the right of the clock tower, as well as on the great barn in the court yard at the back, the date 1669 and the initials HBE. 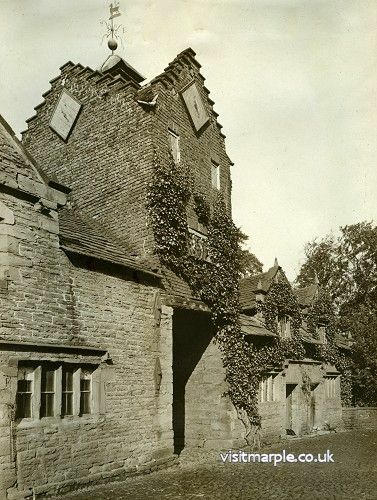 The stables and barns were built mainly of red sandstone, with the exception of the clock tower, which was in brick and contained a clock with the date 1685. The clock tower was probably added at around that date when Henry Bradshawe V was in residence. Henry IV died in 1699 and was succeeded by Henry V who married the daughter of Richard Legh, of High Legh. It was he who placed in position the leaden spout heads carrying the crest of the Bradshawes "Stag at gaze under an oak" and the arms of the Legh of High Legh, "Lion Rampant". In addition other spout heads bore the date 1668 at the east side and at the front alternately 1683 and the initials HBE. Henry V died in 1724 without issue. He was succeeded by his younger brother Thomas, who died unmarried in 1743. On his death the estates passed to Mary Bradshawe, his sister. She was married, for the second time, to Nathaniel Isherwood, of Bolton-le-moors, Lancashire. The estates then passed to their son Nathaniel Bradshawe-Isherwood II who was born in 1713. He married Elizabeth Brabin, of Brabyns Hall and died without issue in 1765. Nathaniel II was succeeded by his brother Thomas Bradshawe-Isherwood II. His second wife was Mary, daughter of Thomas Orrel, of Salterly and they had three sons and a daughter. The eldest son, Thomas Bradshawe-Isherwood III succeeded his father in 1778 but died unmarried in 1791. The estate then came into the possession of his brother Henry Bradshawe-Isherwood , who also died unmarried in 1801. The estates then passed to the youngest brother John Bradshawe-Isherwood I.
John I made a number of changes to the Hall during his time. The drawing and dining room wing was modernised by the insertion of bow windows and three storeys were replaced by two, heightening the ceilings of the dining room and the drawing room above it. He also altered the South and East fronts, replacing the lattice windows on the left of the entrance by French windows. The lines of the original gables which he substituted by square curtain walls could still be traced above the windows. John I married Elizabeth, daughter of the Rev. Thomas Bancroft, Rector of Bolton-le-moors. He died in 1839 and was succeeded by Thomas Bradshawe-Isherwood IV who married Mary Ellen, daughter of the Rev. Henry Bellairs of Deeping Fen, Rector of Bedworth. Although he lived until the age of seventy-five Thomas was physically weak and suffered poor health from an early age. When only twenty-seven years old he suffered a major breakdown in his health and the running of the estates was taken over by his wife Mary Ellen in 1847. They had been married for only six years and had two young children. 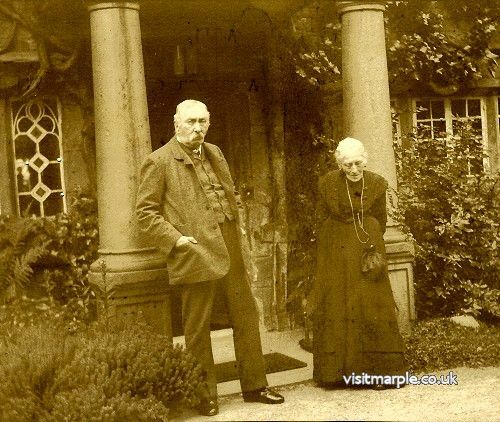 John Henry Bradshaw-Isherwood and wife Elizabeth outside Marple Hall c1907. Mary Ellen was a strong and capable woman. 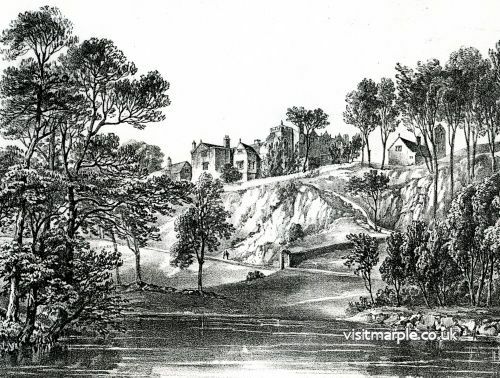 It is said that from the balcony above the entrance door, with her infant son in her arms, she faced an enraged mob of Luddites who visited Marple Hall with destructive intentions during the Chartist riots in 1842. This incident was used by Disraeli in his novel "Sybil". 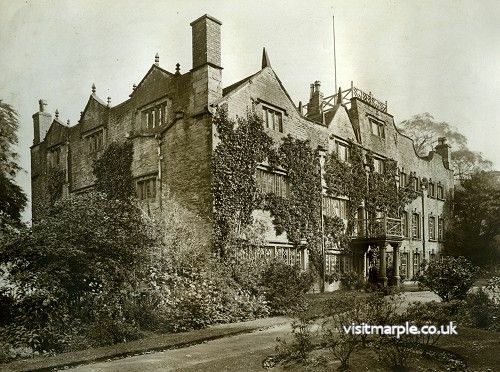 In 1886 Mary Ellen and Thomas moved to Grantham in Lincolnshire, leaving their son John Henry Bradshawe-Isherwood to take up residence in Marple Hall. John Henry is said to have done very little during his time at the Hall, however he was responsible for the installation of electricity in the early 1900's. He married Elizabeth, daughter of Thomas Luce, member of parliament for Malmesbury and they had five children. When John Henry died in 1924, the estates came to his eldest son Henry Bradshaw-Isherwood. Henry was fifty-six years old when he inherited the estates in 1924. He only lived at Marple Hall for a very short time before returning to London. A caretaker then lived on the estate but very little upkeep or maintenance of the buildings was carried out. In 1929 Henry put the majority of furniture and contents of the Hall up for sale by auction. Little is known of where the pieces went, including the family portraits. Henry's marriage failed and he died in 1940 without issue. Following the sale the Hall was open to visitors and available for functions for a number of years. Henry's brother Frank Isherwood was a professional soldier who saw action in the Boer War. He married Kathleen Mackle and they lived for some time at Wybersley Hall, where their first son Christopher was born, in 1904. Because of Frank's army career they left Wybersley in 1907. 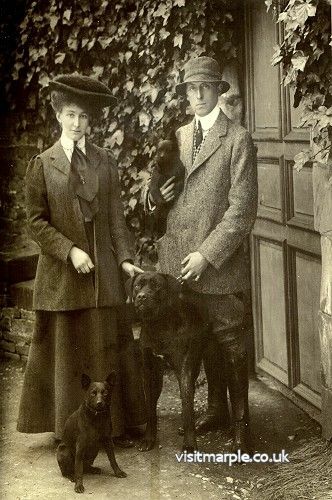 Their second son Richard was born in 1911. In 1915 Frank was killed at the battle of Ypres in France, during the First World War. Both Christopher and Richard Isherwood appear to have had little interest in the well-being of the Hall. The caretakers remained on the site for many years, but following their retirement in 1953 the Hall was left untended and the vandals quickly set to work. The Hall was stripped and looted, the removal of lead from the roof caused a chimney to collapse and fall through the roof causing severe internal damage. In 1954 Richard Isherwood belatedly offered the Hall and gardens to Marple Council but they refused and the vandalism and destruction continued. 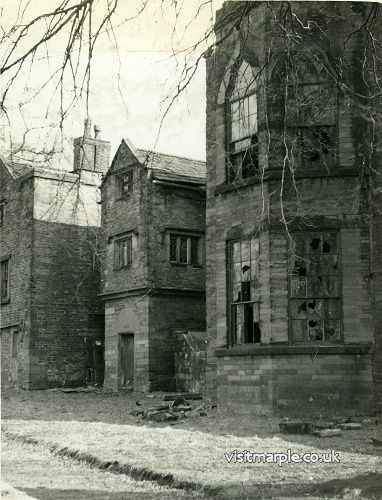 In 1957, when the Hall was a total ruin, it was again offered to the Council. This time they agreed and it was decided that after demolition the foundations should be grassed over and preserved and a suitable plaque erected. Unfortunately even this was to suffer at the hands of vandals and souvenir hunters and all that remains is the lintel stone originally set by Henry Bradshawe III in 1658 and now looking uncannily like a gravestone. On a visit to the site of the Hall in the sixties Christopher Isherwood is reported to have "felt no grimness or sadness" at seeing only grass where the house had stood "only wonderfully joyful". It is unlikely that anyone with the least sense of history will be able to share, or understand these sentiments.